If you are reading this there is a good chance that you like both breakfast food and tacos. 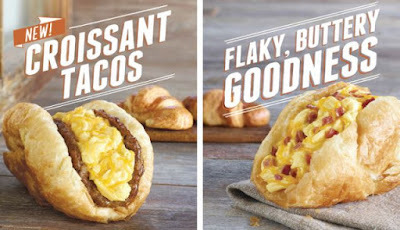 You may also be privy to the fact that Taco Bell is going hard after a share of the breakfast market. Well, now they are testing out their third variation on the breakfast taco, this time with a croissant. It comes with the same fillings as it's predecessors, the waffle taco and the biscuit taco. But this begs the question, what is going to be after the croissant taco? The bagel taco? The pancake taco? The cinnamon roll taco? The options are only as limited as the Taco Bell food teams supply of recreational herbs.